“I see World title fights for me this year, “former WBO junior welterweight champion Chris Algieri says. “The key is being active. 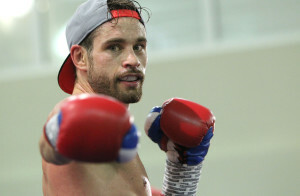 I want to fight every other month, so the focus is win on January 18, get another fight in March and just keep building.” Algieri, who took several years off from the ring, returned last November by besting Angel Hernandez in Algieri’s hometown of Huntington, Long Island. Now the 22-3 New Yorker is set to face Danny Gonzalez at Madison Square Garden’s Hulu Center on the 18th of this month. The fight will be aired live on the DAZN streaming service here in the United States. “Words cannot express how excited I am to get back into the ring just seven weeks after my long awaited return to the ring,” Algieri says. “On top of that excitement I will(be) fighting in New York City at the world famous Madison Square Garden that will be seen live on the premier sports streaming network DAZN.” Algieri made his name when he stunned Ruslan Provodnikov for the junior welterweight championship in 2014. His next fight, however, was a one sided loss in the welterweight division to all-time great Manny Pacquiao. Algieri is particularly happy to be facing the 17-1-1 Gonzalez at Madison Square Garden. “If you ask any fighter in the world and they will all tell you – there is just something inherently special about fighting at The Garden,” he says.” This fight represents another step towards my ultimate goal of regaining my World title at Super Lightweight. I understand the magnitude of this event and know that at this stage of my career each fight is the most important of my life”.